These Healthy Banana Protein Pancakes are uber light, fluffy, and perfectly sweet. One bite and you won’t be able to tell they’re gluten free, refined sugar free, low fat, and packed with a whopping 22g of protein per serving! These Banana Protein Pancakes are super easy to make. Easy peasy. And we don’t need the highly refined white sugar or nutritionally deficient white flour to make them either. Here, we’ve got vanilla protein powder and vanilla extract for a vanilla double whammy, an egg for fluffiness, and a fresh banana for all-natural sweetness and to create a moist pancake texture. 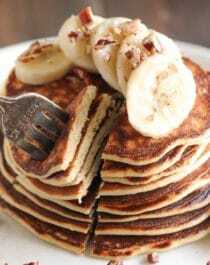 Unlike typical pancake recipes out there, these Healthy Banana Protein Pancakes are made without any added sugar, butter or oil, or bleached white flour whatsoever! YASSSSS! In a small blender (I used my NutriBullet), add the banana, eggs, and vanilla extract. Blend until smooth. Add the protein powder, sweetener, and baking powder, then blend again. Scoop ~¼ cup of the batter onto the griddle. Cook until bubbles no longer appear on the surface and the edges appear dry. Flip and cook the other side. Continue until all the batter is used up. Serve and enjoy! Serve with mini dark chocolate chips, Healthy Chocolate Syrup, Homemade Maple Syrup, and/or Peanut Butter Icing! Tons of protein, healthy fats, and zero added sugar — this is a nutritionally balanced breakfast we can feel good about eating. 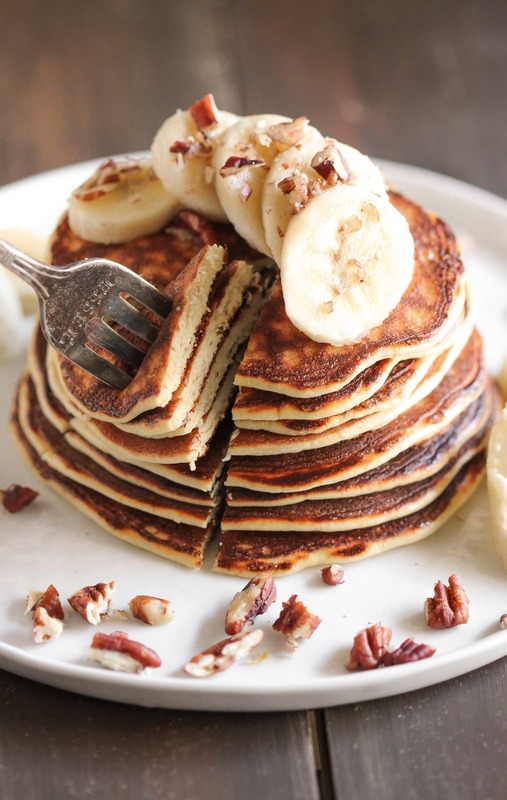 These Healthy Banana Protein Pancakes are fluffy, sweet, and totally addicting. It’s seriously hard to believe a plate full of these pancakes are good for ya. I adore these pancakes! Perfect with cocoa cream and nuts! Totally making these for dinner tonight 😋 can you recommend a protein powder to make this vegan? Haha, I am SO DOWN to have these pancakes for dinner or dessert. I am hoping I can make this with flax eggs and vegan protein powder to make this recipe vegan!